Does Your Fridge Make Soda? Samsung’s RF31FMESBSR Does. I have enough Android tablets in my house that I could probably glue them to every appliance I own. I’m also a seltzer addict. Those two seemingly unrelated sentences are why I thought the refrigerator that Samsung didn’t announce at CES was far more impressive than the one it did. During CES, Samsung announced the code-named T9000 fridge that ran on Android and totally wasn’t designed by Skynet. Meanwhile, they let me take a glimpse behind the scenes at the more impressive but less memorably named RF31FMESBSR . Instead of just giving you cold filtered water, this fridge takes SodaStream 60L cartridges and turns that cold water into seltzer with three different concentrations of fizz. Ok, sure, there’s also a freezer on the bottom, multipurpose drawer in the middle, and ice maker inside. Sure, it’s got LED lights that do better at lighting things up than the dinky light on the front of my fridge, and it’s better at preventing freezer burn on the frozen stuff, but… soda! Ok, I love seltzer water because it tastes good but doesn’t have to have any calories. I go through cases of La Croix. I’d been curious about a SodaStream, but I figured it’s expensive and would be yet another thing I’d have to store in my kitchen. Well, bundle it into my fridge, and that solves the storage issue. Not the expense issue, though. 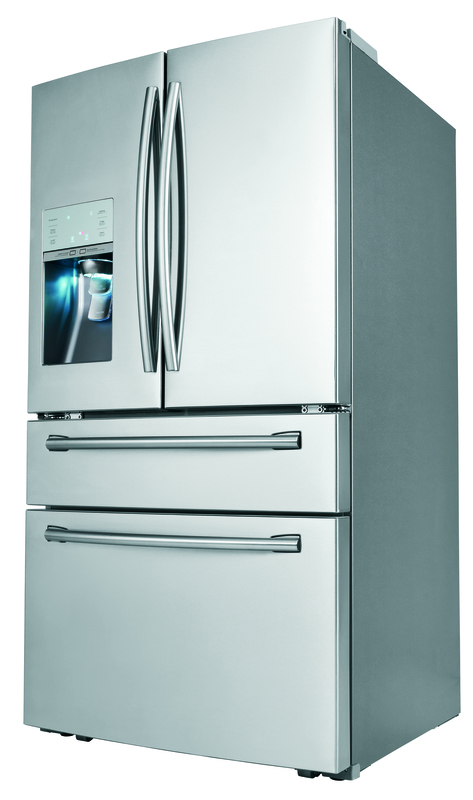 This beauty of a fridge – and it is a total beauty – will set you back a suggested retail of $3899. If you’ve still got your heart (or your tax return) set on it, you can get a new soda making fridge from Samsung in April.